Sadly I needed a sympathy card last week. An old fellow from my congregation passed away at over 90 years old after nearly 67 years of marriage, a pretty good run huh? He had a long, good life. The weekend before he passed he was at a party listening to us all sing karaoke! Apparently not his thing even though we tried to get him to join! So this card was for his sweet wife. I tailor the card to the recipient, I don’t base it on the gender of the deceased. Is that what you all do? I layered ribbon, twine, leaves, small flowers and a larger rose then tucked in a tied bit of tulle. It made for a lovely embellishment cluster. This is such a heartfelt sentiment isn’t it? It really sums up how I feel when someone I really care about loses someone close. 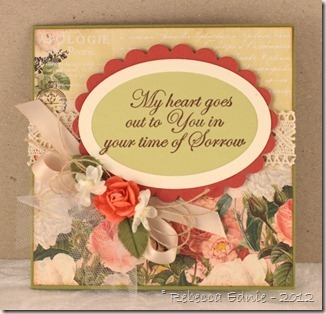 Very pretty card, I'm sure it will provide comfort to his widow.